Before moving to Wilson, brickmason and restaurateur Goodsey H. Holden led a colorful life in Johnston and Harnett Counties. Smithfield Herald, 17 September 1887. The Central Times (Dunn, N.C.), 23 June 1892. On 28 November 1883, Goodsey Holden married Laura McCullers in Johnston County, North Carolina. In the 1900 census of Rocky Mount, Nash County, North Carolina: on Church Street, hotel cook Nathan Eason, 28; wife Mary E., 28; and son Luther, 2; boarder James Dean, 42, a clergyman; boarders Goodsy, 38, James, 26, and Eddie Holden, 16, all brickmasons; and boarder Andrew McCellus, 30, painter. Goodsy Holden reported that he was married. In the 1900 census of Wilson, Wilson County: brickmason Goodsey Holden, 36; wife Lorra, 35; and children Estell, 15, Albertha, 14, and Ianea, 11. In the 1920 census of Wilson, Wilson County: at 603 Spring Street, brickmason Goodsey Holden, 59; wife Laura, 52; and roomer Carrie Strickland, 29, tobacco factory worker. In 1924, the Wilson Daily Times published a notice of execution sale for Holden’s Spring Street property, which meant that a court had ordered a sheriff sale to satisfy an unpaid debt — in this case, to Wilson Wholesale Company. Wilson Daily Times, 24 November 1924. The Holdens’ large South Spring home, as shown in the 1922 Sanborn fire insurance maps of Wilson. Laura Etta Holden died 13 September 1929 in Wilson. Per her death certificate, she was 59 years old; was born in Johnston County to Willis McCullers and Emly Sanders; was married to Goodsey Holden; and resided at 804 East Green Street. Ione Perrington was informant. 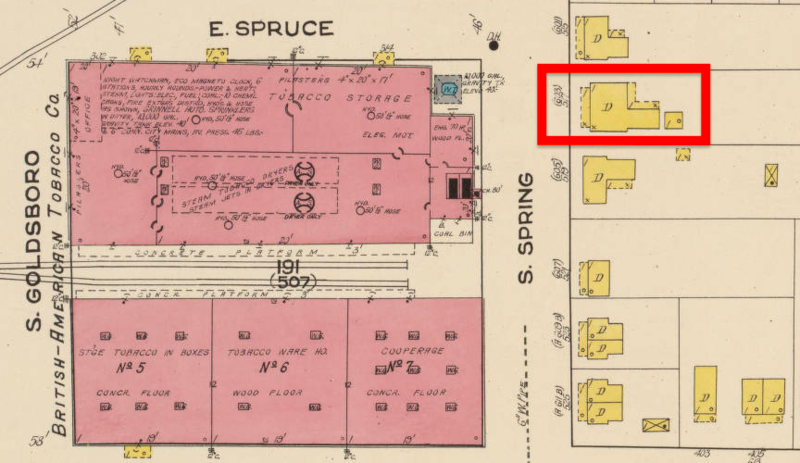 In the 1930 census of Wilson, Wilson County: at 512 East Spruce Street, owned and valued at $1500, Gustus Holden, 65, brickmason, and roomers Ella Farmer, 35, laundress, and Corrine Young, 40, cook. 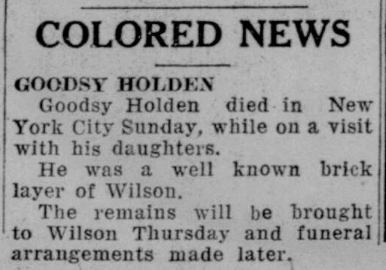 In the 1940 census of Wilson, Wilson County: at 400 Viola Street, widower Goodsey Holden, 77. Wilson Daily Times, 1 October 1947. ← Snaps, nos. 41: J. Frank and Annie Bell Green Barnes.